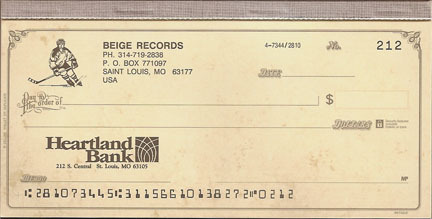 Beige Records was formed in St. Louis by Joe Beuckman and Paul B. Davis in 1998, we are a registered business in the State of Missouri. Cory Arcangel and Joe Bonn became part of the family after Cory, Joe and Paul met at the Oberlin Conservatory of Music. Our first release was the The Bitwise Operators "Tardy Tracks". We sold all 500 copies and one of the tunes got licensed to this UK dance music compilation which made enough money to release more records. The next two were BEG-002 "The Spirit of BEIGE", a 4 track compilation of friends from Oberlin (limited to 200 copies) released in 1999, and BEG-003 "Pretty" (300 copies) which actually didn't come out until after BEG-004. 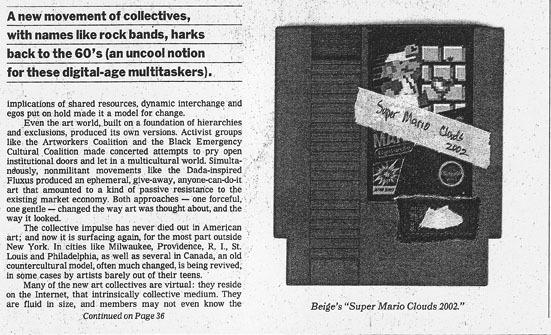 In 1998 work had already started on what became BEG-004 "The 8-Bit Construction Set", our most well known record. Promos were released in 2000 and the official version was released in 2001. Joe did the C64 samples and the C64 program, Cory and Joe did the C64 loops, and Paul did the Atari loops and samples, Atari program, and both Atari and C64 tunes...under pseudonyms of course :) The 8-Bit Construction Set was our perfect record, as it combined ghetto 8-bit sounds, good songs, and a foregrounded desire to make something for the "true heads" i.e. data encoded on the vinyl, ASCII/ANSI graphics, disses to wack crews, etc. Our 5th record was a split 10" with Bodenstandig 2000, most of the material was taken from live recordings of a great show at Danny's in Chicago. However the recording quality was poor and it didn't take to vinyl very well. We got it remastered twice to no avail, and did not release it although there are some test pressings floating around. In 1999 Paul started making art out of Nintendo cartridges and presented the worlds first hacked cartridge game/art/music at his Oberlin Conservatory Senior Recital. Everyone was pretty geeked up about it. To this end we started exploring life making art as well as music, and after graduating Oberlin in 2000 came up with the BEIGE Programming Ensemble (which has its own website) as a sort of art collective. The plan was that we would contribute and share our ideas within the group, and produce work using those ideas in different arrangements, but keep everything under the BEIGE name and rubric. However that type of utopia didn't last...we all lived in separate cities, ideas and work from group members kept appearing as Cory's solo work, and we had different positions about what we wanted as a collective. We didn't collaborate much after 2003's Summer of HTML Tour with Paperrad and our last collaborative project was at the 2004 Whitney Biennial. We've never declared any official end to Beige Records or BEIGE but we've been inactive for some time - this site is at the moment just kept as it was. Try reading through our "what's new" page for a 98-04 chronology of everything, or head straight to our MP3 page or Media gallery for fun stuff.